Ask anyone in optics how a spectrometer works and they can tell you – it separates a beam of light into its constituent colors or wavelengths for qualitative or quantitative analysis of the incoming light’s spectral composition. Spectrometers are widely used for identification, characterization and quantification of substances in many fields of research and industry. Ask the same person how optical coherence tomography (OCT) works and the answer may not be as quick. They can probably tell you that it’s a widely used optical imaging technique known for its high-sensitivity and speed, now a mainstay in ophthalmic diagnostics. They may even be able to tell you that there are two main approaches to OCT: SS-OCT, which uses a swept wavelength source and a single element detector, and SD-OCT, which uses a broadband source and a spectrometer for detection. If you ask them to combine the two topics and tell you what kind of spectrometer is best for OCT, you may not get much detail beyond some basic comments on resolution and sensitivity. In truth, it has to do with several factors, including resolution, SNR, and property that seems very mysterious to the spectroscopist – camera roll-off. To truly understand these, let’s first take a step back to how OCT works. Low coherence interferometry of infrared light is used to estimate the time of flight, quantifying depth and providing micron-level resolution. OCT relies on low-coherence interferometric measurements (learn more in our OCT tutorial). In the first generation OCT devices, this was performed by moving the reference mirror arm of an interferometer, placing the sample in the other arm and scanning the reference arm through different time points (depths) within the sample. Interference between the sample & reference arms carries with it information about degree of scattering at different depths, allowing a cross-sectional image of structure to be created as the beam is scanned across the sample. However, researchers soon realized a more effective way to obtain the same information was by analyzing the light at different wavelengths rather than at different time points (i.e., spectral domain interference vs time domain interference). This change in approach offered an exponential increase in speed and sensitivity, but analysis of the different wavelengths required an appropriate spectrometer. The requirements for a good OCT spectrometer differs significantly from a standard spectrometer used for direct spectral analysis of absorbance, fluorescence, or Raman. OCT spectrometers are required to work at very high speeds compared to standard spectrometers to enable the generation of 2D or 3D images in a reasonable amount of time. Light reflected back from an OCT sample can also have different polarization modes, and thus it is also important to maintain as little dependence on polarization as possible. This is challenging for spectrometers which use a reflective grating in their design, as specular reflection from a surface inherently favors s-polarization. It is also important to realize that an OCT scan is not looking for the location of a spectral peak or the relative or absolute intensity of a spectral band, but instead an interference pattern reported in the spectral domain. This makes the resolution of the spectrometer an extremely important performance parameter. In particular, an OCT spectrometer has very little tolerance for light from one pixel leaking into nearby pixels. If such cross talk occurs, there will be a loss of sensitivity in the image as a function of depth. The loss of sensitivity in OCT as function of depth is called roll-off or fall-off, referring to a gradual decay in sensitivity as a function of depth. 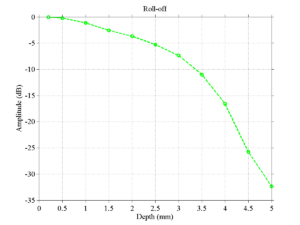 Roll-off is essentially a result of loss of fidelity of the interference pattern. Each individual pixel detecting light in the spectrometer corresponds not just to one exact wavelength, but a small range of wavelengths. A perfect interference effect, however, requires measurement of a single, infinitely narrow wavelength. The figure below shows a typical example of loss in sensitivity vs the depth of measurement. The problem is further worsened by spread of wavelengths to neighboring pixels due to the finite resolution of the spectrometer. While the first issue is fundamental, the second one can be controlled via careful design of the spectrometer optics. Cross talk between the camera (detector) pixels, aproperty of the camera itself, also adds to the roll-off in a spectrometer. Therefore, choice of an appropriate camera (detector) becomes even more significant in spectrometers used for OCT applications. While these features are critical, the need for excellent roll-off reigns supreme when it comes to selection of an OCT spectrometer. We mitigate this need through the use of OCT-specific features like single-mode fiber input and tall-pixel cameras, and proprietary focusing optics that are near diffraction-limited. Off-the-shelf optics often fail to deliver high clarity OCT images because the optical constraints to obtain good roll-off are so stringent. The spot size on the pixel should theoretically be small. In addition, near diffraction limited performance is required across a long array of pixels. These optical design constraints and requirements differ significantly from standard imaging applications, and require spectrometer optics designed specifically for the needs of OCT. The difference in performance is tangible when comparing an optimized Wasatch Photonics Cobra OCT spectrometer design against a spectrometer built with a standard off-the-shelf achromatic lens. We can see from both the MTF (modulation transfer function) curves and spot diagrams that it is extremely important to have a custom optical design to obtain good signal in an OCT spectrometer. In this simulation, we compare the performance of our proprietary Cobra spectrometer design against an optical design using off-the-shelf lenses. 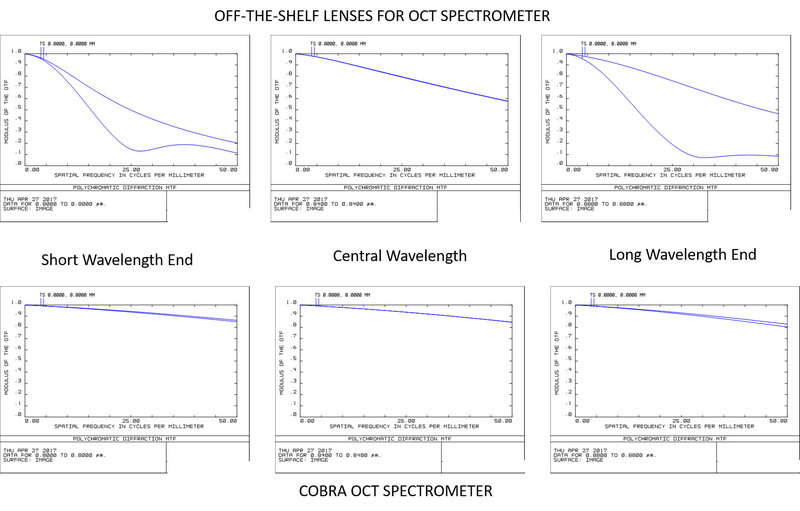 Despite optimizing the combination of off-the-shelf lenses, we see that the Cobra design performs significantly better. The Cobra spectrometer shows excellent modulation transfer functions (MTF) across the entire field, while the standard lenses show significant degradation of the MTF at the camera extremes. One can see that the MTF for Cobra spectrometers are better than 80% for 50 lines/mm frequency, corresponding the Nyquist frequency of a 10 μm pixel width. The off-the-shelf design, in contrast, is around 60% for the central wavelength and falls as low as 20% on the short wavelength side. A similar effect can be seen via simulated ray tracing on the image plane in Zemax. 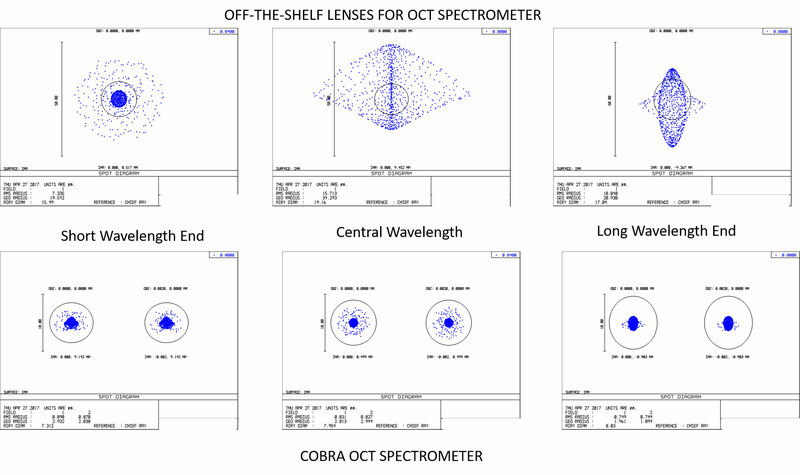 The off-the-shelf designs have much larger spot sizes compared to the Wasatch Photonics Cobra designs; note a 50 μm scale is needed for the off-the-shelf design (top) vs a much finer 10 μm scale for the Cobra spectrometer (bottom). The larger spot sizes for the off-the-shelf designs represent extra aberrations, and result in poor roll-off performance. Spot size on image plane comparison between off-the-shelf lens design and custom Wasatch design using the same diffraction optics. Note that the scale of the Cobra spot diagram has been expanded by 5x to show the detail on its much smaller spot size. While careful optical design geared specifically for OCT can help to significantly reduce the degree of roll-off in an OCT system, crosstalk between camera pixels limits the performance that can be achieved. That’s why we work closely with the best camera providers in the industry to test the newest sensors, moving quickly to integrate those that perform best into our Cobra product family. The e2v OctoPlus camera is one such sensor, and we’ve already built it into our new Cobra-S spectrometer. Though the OctoPlus camera is newly launched, Wasatch has been working with the camera since the early stages of system testing, and is the first and only commercial OCT spectrometer provider to offer this revolutionary camera. With high sensitivity and low crosstalk, this camera enables the Cobra-S to >40% better roll-off and greater clarity than any other OCT spectrometer. Most surprising, however, is its 250 kHz scan rate, allowing the Cobra-S to operata at 2-3x the speed of any other off-the-shelf spectrometer. 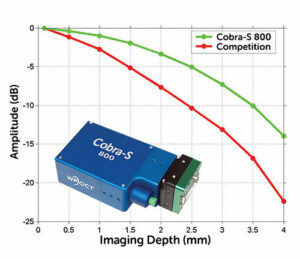 At 250 kHz scan rates and < 6 dB roll-off for 2.5 mm imaging depths, the Cobra-S is a major challenger to swept source systems, approaching the roll-off and speed of SS-OCT concurrently with the cost and resolution advantages of SD-OCT. While an expert in spectroscopy may not understand OCT and vice versa, working with a company that understands the intricacies of theory and design in both fields can dramatically reduce your system design & build time, while significantly improving performance. At Wasatch Photonics, we combine our optimized OCT spectrometer optical designs with the newest and highest quality cameras on the market to offer you the best in OCT spectrometers, like the Cobra-S. Contact us at info@wasatchphotonics.com to discuss your application or OEM customization needs.